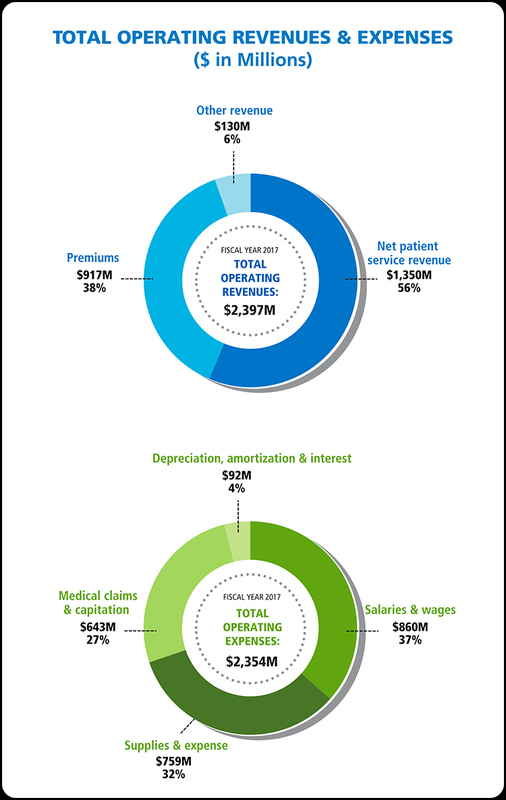 Despite continued challenges from health care reform, including escalating exposure to reduced reimbursement rates from governmental payers (Medicare and Medicaid), Baystate Health finished the fiscal year ended September 30, 2017 with an operating margin of $42.8 million or 1.8 percent before other non-recurring expenses. 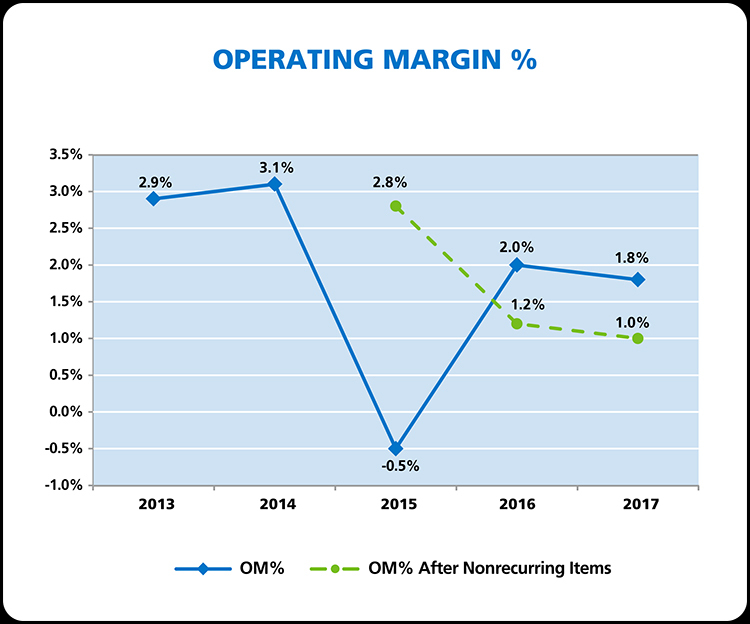 The 2017 operating margin was slightly down from the previous year’s results of $46.6 million or 2.0%, but exceeded the 2017 budget by $0.5 million. The stated operating margin of $42.8 million is before a pension settlement charge of $17 million. When lump sum pension settlements exceed a defined threshold, accounting standards require accelerated recognition of a portion of the loss in the form of a non-cash settlement charge. A total lump sum payment of $42 million was made, which exceeds the defined threshold of $36 million. This settlement charge reduced the final operating margin from 1.8 percent to 1.0 percent. 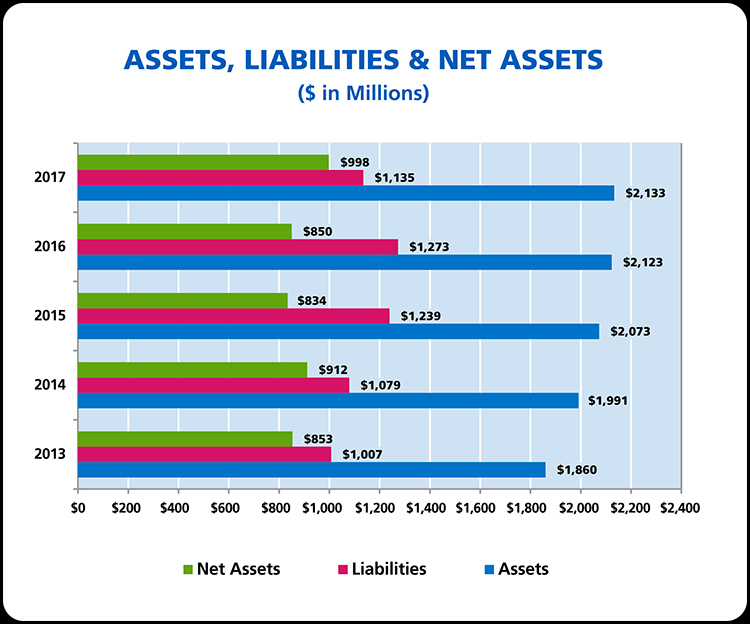 The operating margin significantly impacts Baystate Health as well as other health care organizations as these dollars are invested back in the organization to fund essential capital expenditures including clinical equipment, technology needs, and facilities renovations and construction. Standard & Poor’s, Fitch and Moody’s Ratings affirmed Baystate Health’s A+/A+/A2 bond ratings with a stable outlook in March 2017, October 2016, and June 2017, respectively. These ratings help us borrow for major projects at lower interest rates. Although the organization realized an increase in total operating revenues of 1.9 percent in 2017, operating expenses grew at a slightly higher rate of 2.1 percent. Strong growth at Baystate Medical Center related to increased inpatient volumes was offset by volume-related losses at Baystate Wing Hospital, Baystate Noble Hospital, and Baystate Home Health, in addition to significant one-time costs resulting from the strike by nurses at Baystate Franklin Medical Center. The overall weaker provider performance was offset by strong financial performance at our health insurance company, Health New England (HNE), which executed on its financial turnaround plan for the second year in a row. Health care reform and the Affordable Care Act continue to have a major impact on the health care delivery system nationally, resulting in both Fitch and Moody’s issuing negative outlooks for the not-for-profit hospital sector this year. Commercial health care insurance companies and government payers (Medicare and Medicaid) are putting a greater portion of the payments to providers (hospitals and physicians) at risk based on quality, patient satisfaction, and financial performance metrics. This shift from volume-based, fee-for-service payments to value is forcing hospitals and providers to rethink how care is best delivered. New investments in care management and IT systems to better manage care are essential. Quality performance, patient satisfaction, and the efficient delivery of care are critical to the success of health care systems under health care reform. In addition to the national trends, Baystate Health and Massachusetts hospitals continue to be challenged by the growth and underfunding of the Medicaid program. This program now includes approximately 1.9 million residents or 28 percent of the population and payments from the Commonwealth are more than 20 percent below the actual cost of hospital services. As a result, the Commonwealth has developed an Accountable Care Organization strategy putting providers at risk for the cost of care to treat the population. HNE and Baystate providers are participating in the initiative and will be at risk for 30,000 Medicaid lives beginning March 2018. While undergoing major challenges, Baystate Health is well positioned for the future. We continue to provide high quality, efficient care and are investing in resources required to be successful given the challenges of health care reform and population health. Baystate Health is committed to continuous improvement in the areas of team member engagement, clinical quality outcomes, patient satisfaction, and cost reduction and we expect continued advancements in these areas. Our independent public accountants, Deloitte & Touche LLP, have completed an audit of Baystate Health’s financial statements for the fiscal year ended 2017 and issued an unqualified opinion.